I received the Western University J. D. Detwiler Award for excellence in Biology. I received awards from Western University and Bird Studies Canada/Society of Canadian Ornithologists for travel to present my research at the 27th International Ornithological Congress in Vancouver – thank you! I was awarded the Gilles Brassard Doctoral Prize for Interdisciplinary Research at the NSERC-CRSNG Top Researchers Awards Ceremony held at Rideau Hall by Her Excellency the Right Honourable Julie Payette, C.C., C.M.M., C.O.M., C.Q., C.D. Governor General and Commander-in-Chief of Canada. It was an honour to meet such an inspiring and accomplished woman. I was further invited to give a short acceptance speech at the above event. I attended a round table discussion on Research Excellence with The Honourable Kirsty Duncan, P.C., M.P. Minister of Science and Minister of Sport and Persons with Disabilities. We were joined by the Right Honourable Justin Trudeau, P.C., M.P. Prime Minister of Canada. I was also invited to share my research with dozens of Senators, MPs, and stakeholders at the NSERC-CRSNG event: “Canada’s Brain Trust: Celebrating Excellence in Research“. I don’t expect I’ll ever have quite such a remarkable day in politics ever again in my life! Very excited to announce I have a new paper accepted in The Auk! This is my first PhD-related research paper. I also have a short communication from my MSc to be published online soon in The Wilson Journal of Ornithology! Completed five behavioural experiments with song sparrows! Working through scoring the last twenty of hundreds of videos before heading back into the lab to start extracting bacterial DNA from uropygial gland swabs. This is my first season in 10 years without field work! I’ll be going on lots of hikes for pleasure and posting bird and nature photos taken with my new camera! Gearing up for a series of four behavioural experiments I will be running throughout the month of March! It is both nerve-wracking and exciting to be about to run experiments. I have held 36 song sparrows in captivity at Western University’s Advanced Facility for Avian Research (AFAR) since I caught them in August 2017. None of this would have been possible without the help and support of AFAR staff Michela Rebuli and Francis Boon, my bird-care volunteers Delaney Schofer, Sean Clarkson, Nikita Frizzelle, Sarah Crawford, and Lydia Balogh, and many fellow AFAR faculty & researchers – thank you all! I passed my comprehensive exams! I have officially graduated from PhD student to PhD candidate. Now that the haze has worn off, I am back into writing manuscripts and processing data – it’s good to be back! It’s been such a busy and exciting year! I have submitted a new paper, “Chemical composition of preen oil does not signal malarial infection in songbirds: results from an experimental study” for publication and am eagerly awaiting a decision. I am also studying for my comprehensive exams coming up in January. As well, my lab group are presenting at the upcoming Society for Integrative and Comparative Biology (SICB) 2018 conference in San Francisco! My paper, “Group size, but not manipulated whole-clutch egg color, contributes to ovicide in joint-nesting Smooth-billed Anis (Crotophaga ani)” was recently accepted for publication in The Wilson Journal of Ornithology. Humbled and extremely grateful to announce that I was offered three graduate scholarships this year: OGS QEII, NSERC Alexander Graham Bell CGS-D and the Vanier NSERC CGS! The 2017 field season is off to an excellent and productive start! From April 3 – 14, I banded 48 Song Sparrows at the rare Charitable Research Reserve. I’ve had an excellent start to my behavioural experiment on preen oil and MHC-mediated mate choice, as well! 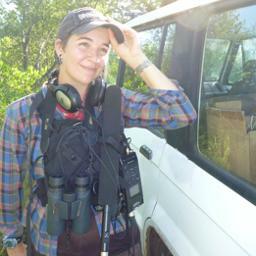 I was awarded the Fred Cooke Student award from Bird Studies Canada and the Society of Canadian Ornithologists – thank you! Excited to be gearing up for the 2017 field season, amidst a busy schedule of GC-FID preen oil analysis & learning how to process 16S rRNA sequences in Mothur. I passed my PhD research proposal assessment! I was awarded the Ruth Horner Arnold Fellowship in Biology. My manuscript, Group size, but not manipulated whole-clutch egg color, contributes to ovicide in a joint-nesting cuckoo, was accepted for review in The Wilson Journal of Ornithology. I completed a successful first field season of PhD research. My lab and I caught 92 Song Sparrows (SOSP) at QUBS in April and May, and I caught another 63 over just two weeks in July. I opened up a new field site at the rare Charitable Research Reserve near Cambridge ON and had a fantastic first go, catching another 53 SOSP in two weeks! That’s a total of 208 blood and preen oil samples to process – looking forward to hunkering down in the lab all winter! I was selected as the University of Western Ontario Department of Biology’s 2016 Vanier Canada Graduate Scholarship nominee. Looking forward to the challenge of putting together a solid application package for this top award! I received a QEII Ontario Graduate Scholarship for 2016-2017. I was offered the Western Science Doctoral Scholarship – a recruitment scholarship awarded annually to five students across the Faculty of Science. Western University, here I come!